The Joint Admissions and Matriculation Board (JAMB) is the government agency empowered to “conduct matriculation examination for entry into all universities, polytechnics and colleges of education (by whatever name called) in the country. In addition to that, it is also vested with the powers to, “Appoint examiners, moderators, invigilators, members of the subject panels and committees and other persons with respect to matriculation examinations and any other matters incidental thereto, or connected therewith; place suitably qualified candidates in the tertiary institutions after having taken into account: the vacancies available in each tertiary institution; the guidelines approved for each tertiary institution by its proprietors or other competent authorities and the preference expressed or otherwise indicated by the candidates for certain tertiary institutions and courses. In the last couple of years, the outfit, which appears to be swimming in an ocean of challenges, has perfected the art of plunging into a fresh challenge as it attempts to get out of another. Interestingly, the challenges, which are mounting consistently if not spearheaded by unscrupulous staff members of the organisation, are facilitated by outfits, which it does business with, including Internet cafés and banks. The current logistical challenge dogging the ongoing registration exercise is another variant of the organisation’s many headaches. 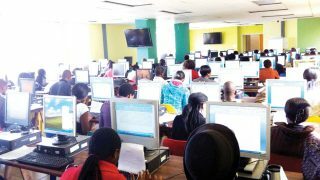 In 2015 when JAMB decided to go full blast with the computer-based test (CBT), it had something akin to a bumpy ride on a tiger’s tail. 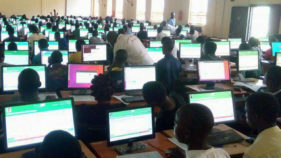 Registration hitches, random allocation of examination centres, insufficient examination centres, as well as, network/connectivity failure held sway before and during that year’s examination. Expectedly, the , then headed by professor of Test and Measurement, Dibu Ojerinde, suffered severe bashing from members of the public, especially parents whose wards were caught in the web. In 2016, calls for the scrapping of the board became deafening, especially in the wake of technical hitches that characterised that year’s Unified Tertiary Matriculation Examination (UTME). Still smarting from the glaring hitches that hallmarked the 2016 examination, which some disgruntled staff members contributed significantly to, JAMB was again involved in another “mess” when its reiteration of the government approved admission model that takes cognizance of merit, catchment and educationally less developed ratios was misconstrued by many institutions and stakeholders. However, as part of efforts to discipline errant staff members, who contributed to the much-maligned 2016 UTME, a senior staff was demoted while five others were marked for transfer out of their present stations as punishment for their ignoble roles. 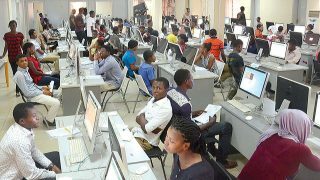 Be that as it may, two weeks into the commencement of the ongoing registration for the 2017 UTME, some applicants find it difficult to access the board’s website and are deeply frustrated with the entire process, which they described as sloppy and cumbersome. Over 1.5 million college admission seekers are expected to register for the examination, and midway into the allowed time, only 600, 000 applicants have successfully completed their registration according to the board. The disenchanted applicants, who are yet to register among other things are complaining of recurring challenges, including inadequate registration centres, failure of Internet connectivity, cumbersome processes in bank payments and general registration hitches. Ahead of the sale of application forms for this year’s UTME, the board had invited all approved commercial banks to participate in the sale of the documents.Sixteen banks and NIPOST attended the interactive session where JAMB explained the reason and need for all of them to partake in the exercise. JAMB registrar, Prof. Ishaq Oloyede, who made the disclosure while delivering his address at the strategic planning retreat on monitoring and supervision of 2017 UTME, added that after the interactive session, “13 banks including NIPOST signified interest to participate in the sale of application forms. Oloyede added that still in the spirit of “our all-inclusive approach, backed by our sincerity of intent and purpose, honesty, integrity and truthfulness and with the sole aim and objective of reaching out to all nooks and crannies, both in urban and rural areas, we had to patronise the NIPOST, a sister agency, which has the reach out to very remote towns and villages. Even when NIPOST could not raise the capital to purchase the pins for the application documents, we had to open a credit line for NIPOST to also vend pin and pay later without reducing the commission that the organisation is entitled to. But the registration process leading up to the examination has been laden with a lot of sad tales from applicants. Having innovated a contemporary sale of application method, which led to the elimination of scratch cards, the board also adopted a cost saving procedure PIN Vending System, which it deemed secured, having succeeded in redressing sharp practices associated with the use of scratch cards. But the teething problems associated with the introduction of the new sales format, has drawn the ire of many applicants and their parents, especially because of the hassles they have gone through, which have also made the anticipated seamless registration exercise a mirage. He added that the process of registering this time around was particularly cumbersome as an e-mail has to be created for applicants, their profiles created, a pin number generated before the registration proper is done. In Minna, Niger State, two female applicants reportedly collapsed during a stampede, while attempting to get registration forms distributed by a JAMB official last Monday, at the entrance of the board’s Zonal Office in Minna. Ntiense Livinus, a resident of Uyo, Akwa Ibom State, in an interview with The Guardian expressed shock that despite what looked like an elaborate preparation that JAMB made this year, having access to applicants’ pin numbers, poor Internet connectivity and the very slow pace of registration are pointers to the fact that the examination itself could be warped like what was the case in the last two years. “This new system has made the process of registration very cumbersome. I must confess that the registration process for last year was never this arduous even though the examination process of that year was also a different kettle of fish,” said Livinus. Aware of the trauma that young Nigerians preparing to write the 2017 UTME are undergoing, the House of Representatives urged JAMB to extend the registration deadline by at least another month to create more space for prospective applicants. The call made on Tuesday, was contained in a motion raised by Danburan Nuhu (Kano-APC), who also urged JAMB to deploy safety equipment to each centre to forestall any incidence of stampede due to overcrowding. But the JAMB registrar, in reacting to the litany of challenges faced by applicants across the country attributed it to the uncooperative disposition of some registration centres. He further claimed that facilities put in place by the examination body were being under-utilised, adding that delay in assigning registration pins to candidates by banks was because of the failure to stick to laid down instructions. He regretted that banks that were instructed to create profiles for the candidates, rather than doing so connive with some centres, where they send the applicants to for profile creation, even as he added that some banks haven’t deployed enough manpower for the exercise. Oloyede wondered why nearly all candidates prefer to be attended to at the 36 JAMB centres, when there were 650 CBT centres in the country, which are capable of facilitating seamless registration exercise.